Steeple, sun, shadows, skirts and Siezer the dog! 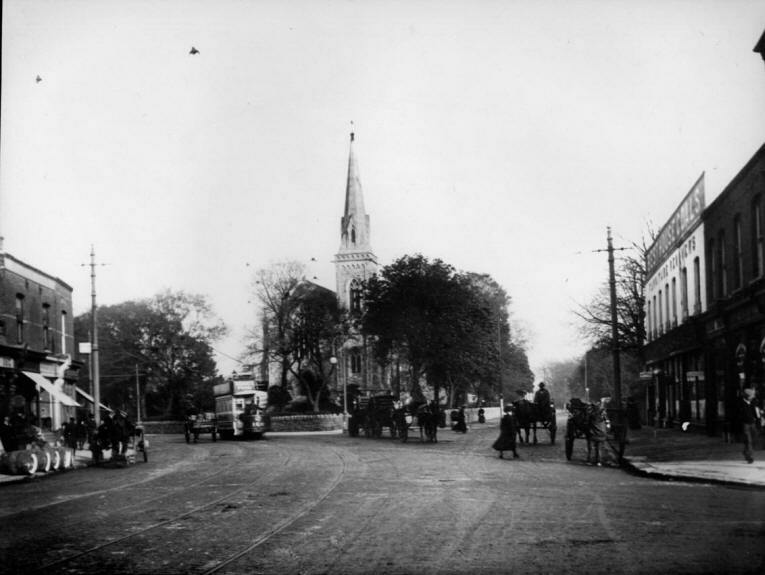 This beautiful Eason shot of Rathgar at the turn of the 19th to 20th centuries features the steeple of the Presbyterian "Christchurch" and a whole world of other detail! I love the fact that the vast majority of the people on view are ladies and girls! Electric trams but no motor cars might provide some clue as to the date but I could sit here all day and enjoy it. The general consensus is that this is after 1900 (electrified trams, fashions) and before 1920 (lack of cars, businesses visible, etc). Of the businesses visible, those on the left of the street (Heffernan's grocers and wine merchants at no.108 and Perry's fruiters at no.106) had a presence from the late 1890s through to at least the mid-1910s. Others (like Hanlon's butchers at no.107) seem to have been later arrivals - but apparently a fixture until the mid-1920s at least. Is that a DOG I see? www.google.ie/maps/@53.3118942,-6.274573,3a,75y,58.66h,92... After 1901, when the tram system was fully electrified, from horse power. Before 1911 when there were a total of 5,058 registered cars, buses and lorries in Ireland, a large proportion based in Dublin. OSI 25" link (not that much has changed). The #15 tram tracks and overhead wires are the big change. Fashion guesses? I am thinking 1910, max 20. Folks look well dressed, affluent. The guy with the flat cap is a tram driver going to work at the tram depot, about a half mile behind the photographer. Ed. Perry appears at 106a in the 1913 phonebook courtesy of lennonwylie. That's a real Bloomsday image - fantastic! [https://www.flickr.com/photos/beachcomberaustralia] Yes, the lady with the hat in the background has disposessed the man with the cap of his bicycle by the time the photo above was taken. 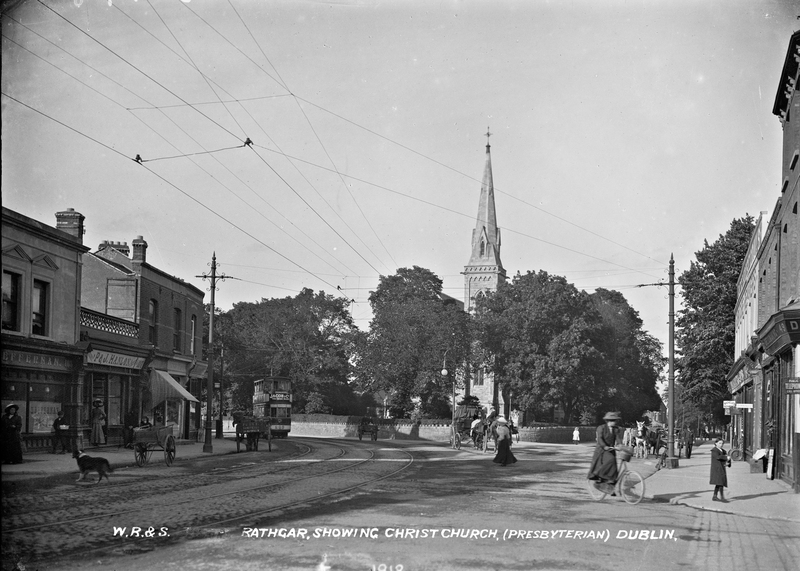 We have solved the cold case of the mysterious Rathgar bikejacking of 1902. Thanks all! I have updated the map, tags and date. I concur on the c.1910 (give or take a few years) - not least as it lines-up with the dates we had for others in the W.R.&S (William Ritchie & Sons) Eason postcards series! [https://www.flickr.com/photos/[email protected]] Who'd have thunk the solution to the mysterious Rathgar bikejacking of 1902 was sitting in Library Towers all along?! [https://www.flickr.com/photos/[email protected]] Good spot, fellow niall. The signage here says Dressmaking. This picture provides more detail of the large sign on the roof of the building on the right hand side ".. COALS" ?